Imagine a city in which quarterly sales tax receipts rise almost sixty percent in a year, to $857 million, and where bankers have too many deposits compared to the number of loans they would like to make. Imagine a city with such robust business that two airlines compete to start regional jet service there. You've discovered the reality of Williston, North Dakota, center of the Bakken/Three Forks oil boom. The driver behind all this activity is a near-vertical increase in crude oil production to 700,000 barrels per day (August 2012). In March, North Dakota (first and second graphs) became the second-largest producing state following only Texas, larger than OPEC member Ecuador. If oil prices stay strong, industry estimates are that Bakken production will grow to over a million barrels per day (BPD) and ultimately could be sustained for several years at two million BPD. Oil prices above $50/barrel coupled with North Dakota's private (rather than state or federal) land ownership and the breakthrough technologies of horizontal drilling and multistage fracturing led to development of its Bakken oil shale. Because producing from unconventional oil shale takes on the character of manufacturing, it requires significant capital, but the per-well sums of $6-$9 million are fifty to a hundred times less than for deepwater offshore drilling. Still, the focus of companies here and in other unconventional basins is on reducing drilling costs and increasing transportation and refinery market options. In 2008, the US Geological Service (USGS) confirmed a Bakken reserve size of four billion barrels (Middle Bakken only). This is the second largest US discovery next to Alaska's Prudhoe Bay and the largest continuous oil accumulation the USGS ever assessed. It expects to release a new estimate near the end of 2013 that will also include Three Forks reserves. Lynn Helms, Director of North Dakota's Department of Mineral Resources, estimates 10-14 billion barrels of oil recoverable in the state, most of which is Bakken/Three Forks. With the discovery of three more "benches" of similar source rock, Continental Resources considers recoverable reserves to be 27-45 billion barrels. Acreage is valuable: the QEP purchase of a $1.38 billion package valued the area at a new high of $21,500/acre, according to Chris Sheehan of Oil and Gas Investor. The North Dakota Industrial Commission (NDIC) notes 191 rigs are active in North Dakota. This is down from 200 rigs about a year ago and near the basin limit, considered to be 200-250 rigs. Approximately two thousand wells are on the NDIC's confidential well list. The North Dakota Petroleum Council estimates ten to fifteen years will be required to fully drill the Bakken/Three Forks formations. Expert James Mason, quoted in The Oil and Gas Journal estimates "well saturation" in the areal extent of the Bakken at 2034 at the earliest, with the formations expected to produce for at least thirty years. The formation varies by shale thickness and total organic content (TOC). This leads to variations in economic success, even more so than factors like the number of horizontal stages per well and the length of the horizontal section. Interestingly, according to the Energy and Environmental Research Center of North Dakota (EERC), larger TOCs are associated with greater underground pressure and increased natural pressure-related fracturing in the rock. Second, permeability is the most important geologic characteristic because it allows flow. Since permeability is often low, says the EERC, the presence of natural fracturing becomes a critical component of oil production. With production better near natural fractures, it is no surprise that some of the most productive wells have been drilled near the Heart River Fault (Dunn County) and east of the Nesson Anticline (Montrail County). In evaluating raw revenue impact, the other factor besides volume is oil price. Bakken crude is sweet (low-sulfur) and light, 36-44 degrees API: almost identical to oil standards West Texas Intermediate (WTI), Light Louisiana Sweet (LLS) and Brent. As the graphs at the end of this note show, LLS and Brent both have recently tended to trade above the price of WTI-Cushing because of the limited transport and storage capacity for crude from the many producing fields—including Canada—into and out of Cushing. As a consequence, once closely tied to Brent, WTI has sometimes fallen more than $20/bbl below Brent, as it now is. Brent, the global price, is set more by Asian, African and European production and demand. WTI is the second benchmark. A third reference price is LLS, a proxy for the value of light crude on the US Gulf coast (USGC). The fourth key oil price is the regional price at the Clearbrook, Minnesota terminal, considered to be Bakken oil's local value. Clearbrook was as much as $27/bbl less than WTI in February 2012 due to lack of transportation and MidContinent refinery outages. It is now closer to parity with WTI because of increased takeaway capacity, mostly rail, and thus more markets. Oil prices are subject to the global economic outlook. However, because the US uses more oil than it produces and because oil, unlike natural gas, is easily traded worldwide its price has stayed strong, above $80/barrel. Should the price of oil fall below $60-$70/barrel, Bakken/Three Forks and Canadian oil sands drilling would slow. Both are more expensive to produce than other sources, particularly the Middle East. The initial market for Bakken crude oil was the PADD 2 (MidContinent) market of 3.6 MMBPD, a region that is already a target for much of the 2 MMBPD of the Canadian production that the US imports. So that quickly overfilled. Pipeline transportation to Cushing (Oklahoma) storage and from Cushing to the Gulf Coast, home to 8.5 MMBPD of capacity was limited. Capacity south out of Cushing increased by 150,000 BPD with the reversal of Seaway pipeline in May 2012. Seaway is expected to expand to 400,000 BPD by early 2013. The partners, Enterprise Products and Enbridge, plan to eventually expand it to 850,000 BPD. Since pipeline capacity out of North Dakota is only 360,000 BPD (with another 75,000 BPD due by year-end), it has not caught up to production. Railroads have taken up the slack, at a cost of $12-$20/bbl to move oil to the US Gulf Coast and other places. 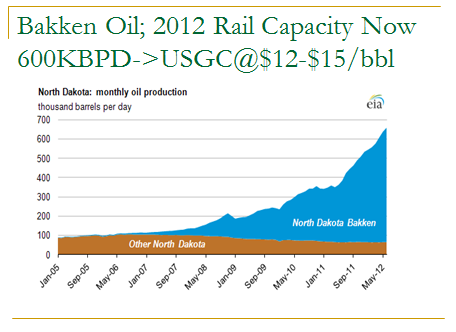 Already, rail capacity increased from 275,000 BPD in 2011 to what is expected to be 775,000 BPD at the end of 2012. Chief among these is BNSF Railway, a Warren Buffett/Berkshire Hathaway company, which ramped up its capacity and is now said to be moving forty percent of Bakken crude output. BNSF expects to be ready to move one million BPD of Bakken crude when needed. Some oil companies—Tesoro, EOG, Statoil, Phillips 66, and others ? have built rail lines and terminals and leased rail cars themselves. Railcars can deliver North Dakota crude directly to refineries and avoid the Cushing, Oklahoma bottleneck. 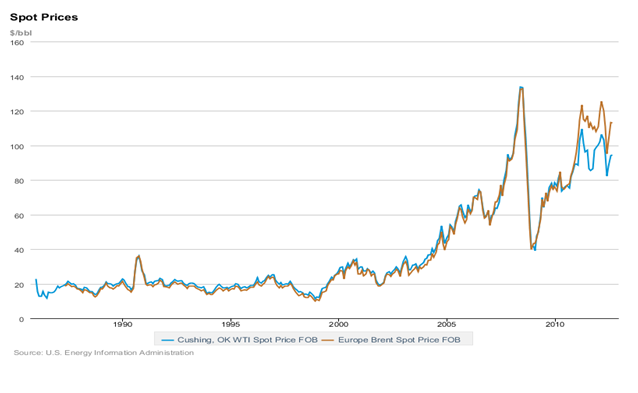 At times, this has unexpectedly caused the Clearbrook price to be higher than the WTI-Cushing price. Although Bakken currently rules the rails into the Gulf Coast, the USGC refining market is world-competitive. 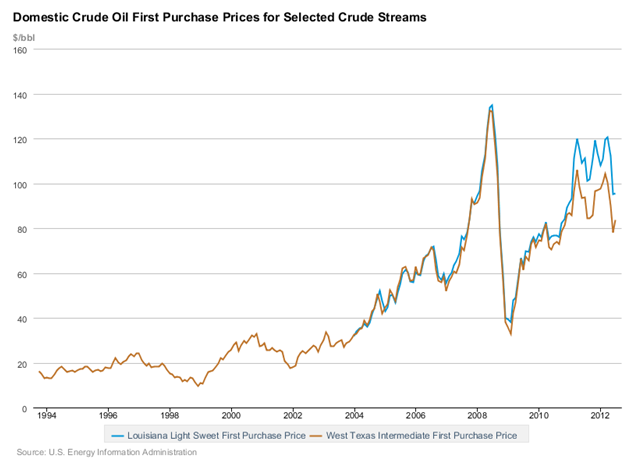 At the Gulf Coast, Bakken crude competes with imported sweet crudes, Light Louisiana Sweet, and Eagle Ford production. There and in the MidContinent it competes with Canadian crude, Permian Basin crude (WTI), Niobrara basin crude, and Mississippi Lime production. The movement of Bakken crude to the USGC has become a powerful force. Along with the Cushing capacity issues, the increased volume of Bakken crude has put downward pressure on the price of oil in other US basins. Also note that US refineries have generally been optimized to use cheaper heavy, sour crude oil. Using more light, sweet crude requires capital expense for reconfiguration, a competitive issue. At present, pipeline expansions are proposed for several point-to-point deliveries which, if built, should reduce costs. These include but are not limited to the Keystone XL extension, the OneOK Bakken Express, the Enbridge pipeline between Clearbrook, MN and Superior, Wisconsin, and importantly, the Seaway reversal opening up more pipeline capacity between Cushing and the USGC. More Bakken crude could also move to the West Coast by rail—Tesoro has recently added 60,000 BPD of railroad unloading capacity at its Anacortes, WA refinery. On the East Coast, Bakken crude has begun to displace pricier light, sweet North Sea and African crudes. A 330,000 BPD Sunoco refinery in Philadelphia, PA, has been resuscitated and joint-ventured with Carlyle on just this basis. Its new rail facility will be able to unload 140,000 BPD of Bakken crude. Critical infrastructure needs are a daily reality in western North Dakota. Roads require repair due to the extraordinary truck traffic, news articles cheer each new apartment or RV park because housing is so limited; hospitals are understaffed and hospital employees need places to live, and service jobs go begging. Walmart advertises starting pay in Williston at $17/hour, compared to its national average starting pay of $8-$12/hour. 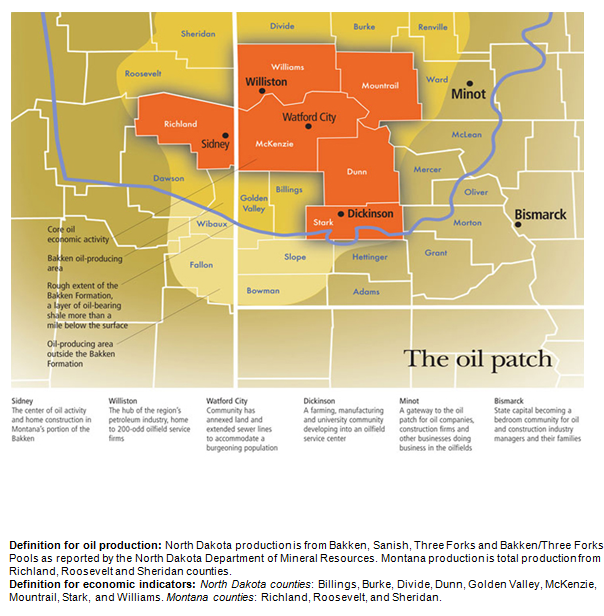 The importance of the Bakken/Williston oil production to the regional economy now and in the future is illustrated by the focus of the Minneapolis Federal Reserve Bank on its oil patch (see map). 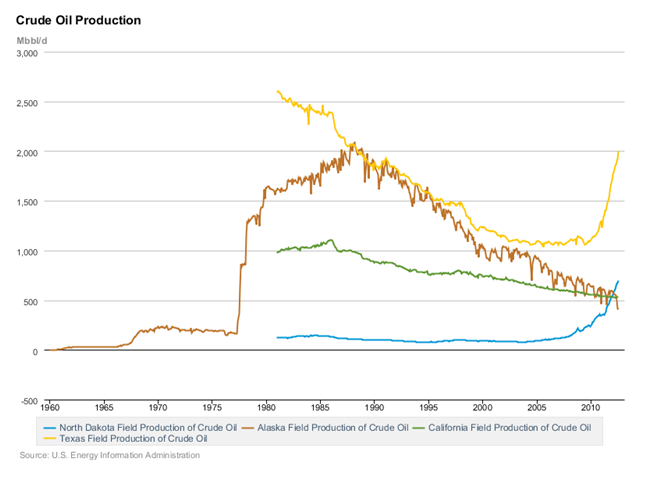 But in fact, the increased production of Bakken crude has and will have national, and even international, consequences. Map from the Federal Reserve Bank of Minneapolis.